“*” indicate Pro or In-App Purchase Options. Select the “+” button to add an agenda. 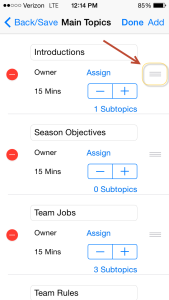 Select the “i” button next to an existing agenda to duplicate an agenda. 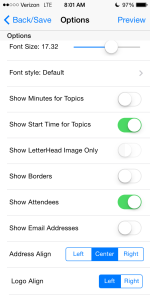 Add/Change the Title of your Meeting. This field does not show on the Agenda but gets recorded on your calendar* by this name. Select Calendar* to add the date and time of your meeting, add invitees, etc. Select Letterhead* to add a letterhead and/or logo to your agenda. Set Organizer, Location, and Meeting Details. The fields entered for the Organizer will show on the Preview. If you are not uploading a letterhead with business information listed and you want the information printed on the agenda, enter the fields desired. Information entered here will show on the header of the agenda. Show Attendees can be turned on or off. Add email addresses for automatic agenda emails, for exporting* and sharing. Optionally select from address book*. Hint: To Rearrange the Topics select “edit” and the icon to the right of the topic and drag it up or down (see image). Select Options to Finalize the Look of your Agenda. “Edit” on the Main Screen allows you to delete an agenda. Pocket Agenda Files are saved as a unique file extension type and readable by other Agenda NOW! Users. While we have added multi-page agendas on our feature request list, currently Agenda NOW! is limited to one page. With Pro or Font sizing you can decrease the font size to shrink to fit if needed. Simply press “Edit” on the Topics Screen and the icon to the right and drag and move them! A logo can also be a simple heading for the Agenda (see the sample agenda) for an example. Simply “duplicate” the sample to use the logo file.